I worked from my kitchen most of the morning and into the early afternoon, then around 2:30 or so I was ready to go get my 5 miler in. As I was getting ready to run out the door, Jennifer asked if Jazzy could go with me. My first reaction was "No, not today, but maybe on my next run." We hopped in the car and went down to Marie Hickey Trail (2 mile loop). Since this is her first "trail run", I'll start her off on an easy 2 miles at her pace and then I'll come back out later in the day to get my other 3 miles in. She's hiked this trail with me a few times, so she knew how long it was. 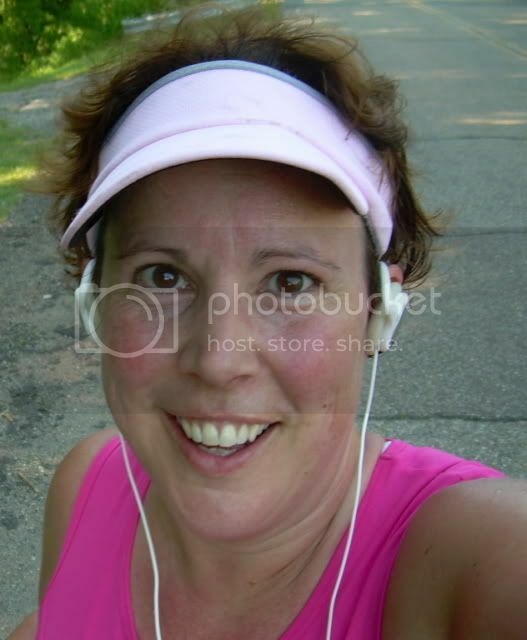 She ran beside me for a long way (maybe 1/2 mile) very slowly, but in jogging motion. She is a very cute runner; arms, legs, head, everything moves when she runs. :) I gave her one of my Nathan water bottle gloves and she felt like big stuff. Of course she filled the zipper pouch with flowers, leaves, and rocks to give to Mommy, and I carried it most of the way. She tripped over 2 roots and the second one was doozy, but she jumped up as quick as she fell down and brushed herself off. The entire 2 mile loop took us 53+ minutes, and she was pretty wore out from the hills. I gave her some crazy credit and told her she's now a "trail runner". She jogged behind me for quite a ways. At one point, we walked for a good distance to just "take a bwake", and she finally spoke up and said "Can we run again? ", to which I said "SURE! Let's go!". Of course, we would have to stop every so many yards to look at flowers, bugs, and other cool things to add to her zipper pouch. :) I showed her what rock moss was and she was fascinated by it. "Feels wiewd!" I realized tonight that I have to do this more often! Man, I'm so happy Jennifer asked about taking Jazzy with me; we had a blast! She has told everybody about "running with daddy" today and she was so proud to spend that time with me. I'm a lucky dude! Nothing like trail running with my little girl. That is great. You got a very good workout with your daughter, using different muscle groups than the running muscles. Very nice. Sounds like there will be plenty of Daddy / Daughter quality miles in your future. The time with family is most important! My daughter is 12 now and I would low to go do it all again. Now I cherish every second I have at 12.